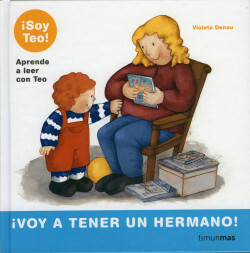 Original title: ¡Voy a tener un hermano! A collection designed for children who start reading. The short passages alongside the illustrations, as well as the type used -capitals and handwriting- help them to take the first steps in acquiring this important habit. The words selected and taken out of the sentences and the drawings that accompany them allow the reader to focus his attention on them, and add them to its vocabulary. - Today is my birthday! - I’m going to have a brother! - What a fuss with so many animals!